Here in California, pruning may have been appropriate as early as January, depending on the class of the rose plant. Why should we prune? Because pruning encourages new growth and bloom, improves air circulation, and helps to shape the plant. It also brings you up close and personal with your plants, allowing you to wash off aphids with a water blast at first sign. Pruning is a spring activity, dictated in cooler climes by the blooming of the forsythia bush. If you haven’t any of these harbingers of warm weather, or live in southern California, watch instead for when the leaf buds begin to swell and redden on your rose plants. 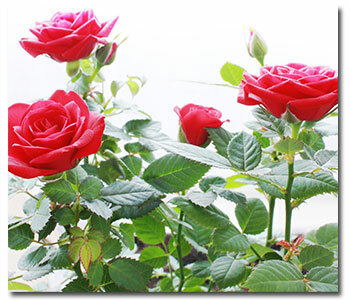 To ensure you’ve rid your roses of all lingering diseases and insect eggs, you can fool the plant into a brief period of dormancy by removing all of the leaves. This allows the plant to enjoy a fresh start, and makes it easy for you to remove all debris from the rose bed and replace with fresh mulch. After pruning is also the time to begin feeding; we recommend using Bayer® All-In-One Rose & Flower Care for fertilization and insect prevention. We’ve answered the “why” of spring pruning, but now we’d like to deal with the specific needs of each class. For modern floribundas that bloom once on new growth, prune hard (1/2 to 2/3 of the plant’s height), removing old woody stems, and leaving 3 to 5 healthy canes evenly spaced around the plant. Cut these from 18 to 24 inches to encourage continuous blooming. Hybrid teas and grandifloras also are new wood bloomers. Prune them in early spring by removing dead and weak wood in an open vase shape, removing center stems. Reduce the remaining stems down to 18 to 24 inches. Whenever possible, cut on a 45 degree angle. Ramblers bloom only once, on old wood, and may be pruned right after flowering to remove winter damage and dead wood, or to shape. And although climbing roses are repeat bloomers, the above should be followed for them as well. Modern shrub roses are repeat bloomers on mature, but not old, woody stems. Do not prune them for the first two years, afterwards employing the “one-third” method; each year remove one-third of the oldest canes. Bourbons will repeat bloom on both new and old wood. Prune to remove the dead wood prior to flowering; after the initial flowering you may perform a hard prune and shaping. Alba, centifolia, damask, gallica, and moss roses bloom only once, producing flowers on old wood; pruning is required only to remove dead wood and for shaping. And miniature roses require pruning only to shape. When pruning is complete, carefully rake up and discard all pruned material, including leaves and old mulch, and toss all out with the trash; this will discourage diseases and insects. If you have been troubled by fungus diseases on your roses, a spring spray of lime sulphur will kill the over-wintered spores of black spot and mildew.